Cross-country skiing has many advantages. You can do an intensive but joint-friendly training to improve your endurance and strength in fresh air and in a very short time. During cross-country skiing, you use most of your muscles (nearly 90%), your metabolism is encouraged, the oxygen exchange in the cells is improved and your wellbeing is increased. 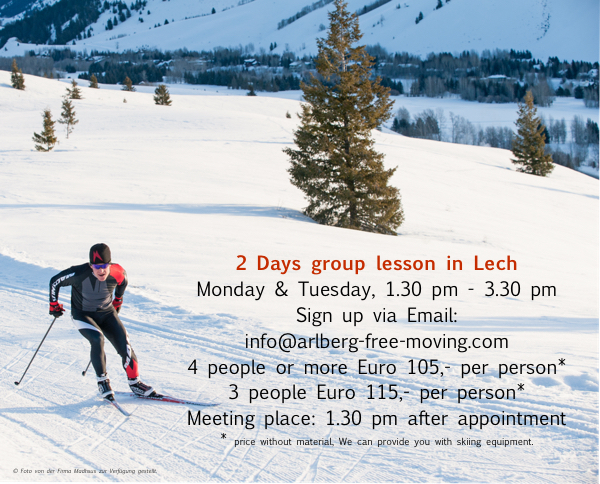 We will help you starting this trendy sport or support you if you want to improve your technique in classic or skate skiing. The advantage of private lessons is that we can cater for your individual needs and demands. Therefore, we may ideally support you in achieving your personal goals. Learning in a group with your friends or family is twice as much fun as learning alone. What do I need for cross-country skiing? We would like to advice you when choosing your cross-country skiing material. If you need to rent sticks, shoes and skis, we will organise the proper material for you. Depending on the technique: classic or skating cross-country ski. Depending on the technique you have to choose different length of sticks. For skating you normally use longer sticks reaching to the chin. For the classic technique you use a length reaching to the armpit. The shoes should stabalise and fit tightly. There is also a difference between a skating shoe and a classic shoe. Generally there should be a space of 1 centimeter between the top of the shoe and your toes.